Merry Christmas and Happy Holidays everyone! I have brought you a gift! It’s another awful Hulk Hogan movie! You’re welcome! This movie is a bit farther along in the timeline from where I’m at on the PPVs, but I wanted to do something Christmas themed. This bonus is a way of saying thank you to the loyal and growing readers of this blog. We are almost up to 2000 likes on Facebook (at the time of this writing). I plan on doing another bonus after the new year. I was thinking of doing Royal Rumble 2019, but I discovered that Elimination Chamber 2019 will be in Houston. I might attend that show and review it as a bonus instead. I will keep you all posted. Now, on with the show. Santa with Muscles was released in 1996 and John Murlowski directed it. It was co-written by Jonathan Bond, Fred Mata, and Dorrie Krum Raymond. It would be more accurate to say it was re-written by them. The original writer had his name removed from the project because they changed so much that it no longer resembled his original work. That seems to be a recurring theme with Hogan movies. It’s never a good sign when a movie has multiple writers and this is no exception. On the production side, we have a surprising name. The Executive Producer of this movie was Jordan Belfort. Yes, it is THAT Jordan Belfort. The Wolf of Wall Street helped produce this movie and I’m sure there was plenty of cocaine involved. It would certainly explain why this movie is so bonkers. I remember watching WCW around the time this movie was released and Hogan kept wearing the hairpiece he used in this movie. I found great amusement in Randy Savage yanking the piece off Hogan’s head at Halloween Havoc ‘96 and the commentators joking that he scalped him. Sorry, I know that’s spoilers for stuff I haven’t covered yet on this blog. We will get to that soon enough. For now, it’s time to give this insane movie a look. The movie opens with the voice of a young girl (Aria Noelle Curzon) writing a letter to Santa. Her voice almost sounds fake because it’s so overly sweet and high-pitched. I think I might have gotten diabetes from hearing it. In her letter, she tells Santa about the eccentric millionaire, Ebner Frost, who is terrorizing the town of Lakeville. He has been bullying people into selling their business and their land. People have begun moving away because of it. He has even attempted to take away the orphanage where this girl lives. She’s interrupted by the sound of yelling outside and looks up to see someone dragging the orphanage’s Christmas tree down the road. Undeterred, she continues her letter. She says that there are only a few days left until Christmas, but she wants Santa to do something about Frost. She signs the letter as Elizabeth Bentley-Walsh and then adds a P.S. to say she hopes Santa is out there somewhere. 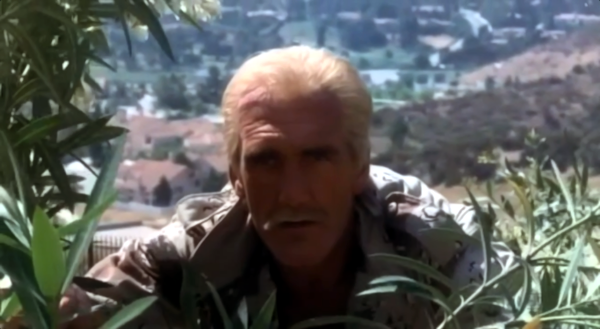 The movie immediately cuts to Hulk Hogan skulking in the bushes. Don’t worry. He’s not outside the orphanage. It’s not that kind of movie. It’s strange seeing Hogan with more hair on top of his head than on the back. Hogan is spying on a mansion and spots a man with a machete patrolling the perimeter. He waits until the man stops to admire a plant before jumping him. Hulk knocks the machete out of his hand and punches him. He then tells the man, “Never stop to smell the roses!” It didn’t sound like a one-liner. It sounded like he was giving him advice. Hogan then proceeds to the patio and attempts to grab a small gold box, but he’s attacked by various members of the mansion’s staff. The chef, the limo driver, two gardeners, and even the butler, all try to fight him. Hogan fights them off with cheese platters until they surround him. It looks like his goose is cooked, but he says, “Time!” The fighting stops and someone hands him a robe while Hulk asks how he did. It’s revealed that this is his mansion and he has his staff do these drills to keep him in shape and on his toes. He does this because he sells fitness supplements and health foods. We learn that his name is Blake Thorne and he is a bit of a cheap-skate. He won’t give his staff Christmas bonuses. When his butler asks about giving to charity, he suggests giving them health bars instead. He complains about how his picture on the products isn’t big enough and then quizzes his staff on their knowledge of his numerous rules. He loves to create new rules all the time, which are usually basic ideas like, “Never mix business with pleasure.” Blake then prepares to join his friends for a game of paintball and gets dressed in camouflage. His friends arrive and they leave in a caravan of Jeeps, Hummers, and motorcycles. Back at the mall, one of the elves from the Santa attraction (Don Stark from That 70s Show) is on the phone with someone. Don assures the man that he will get the money he owes, but he seems rattled. Then, the mall manager enters the room and announces she will give $50 to anyone who can produce a mall Santa. Don realizes this is his opportunity, so he tells the man on the phone that he has to go. The movie then cuts to yet another scene because an overly-caffeinated squirrel must have edited it. The man Don was talking to is revealed to be Ebner Frost’s personal physician, Dr. Blight. With a name like that, I’m sure he’s had quite a successful career! This is where the movie starts to get weird. Blight has a man strung upside down on the front lawn of Frost’s mansion. It’s a unique lawn because all of the decorations are covered in plastic and there are sprayers stationed around the property that occasionally emit an unexplained mist. Blight then places a TV monitor in front of the man and Frost (Ed Begley Jr.) appears on the screen. Ebner tries to convince the man to sell his shoe store, but the man refuses. He then introduces the man to his goons—er—I mean scientists. First, there is the geologist, Mr. Flint. He threatens to turn the man into a fossil. Next, is the chemist, Dr. Vial, who threatens the man with methane gas. Finally, he introduces a woman whom he calls, “Electrifyingly beautiful.” Her name is Miss Watt. He doesn’t state her area of expertise. She simply threatens the man with a pair of electrified gloves that she wears. At this point, I have to ask if I switched to a different movie. This changed from a Christmas movie to a cheesy comic book film. Back at the mall, Blake has arrived and is sneaking around the hallways. He spots a Santa suit and decides to use it as a disguise. I’m sure you can see where this is going, but you’d only be partly correct. He dons the suit and starts to sneak away, but the cops arrive and ask him if he’s seen Blake. He plays ignorant and walks away, but a kid spots him. Blake basically tells the kid to get lost, so the cops realize he’s not a mall Santa. They also spot a bit of Blake’s camouflage clothing peeking out of the suit, so they chase him. Blake loses them by hiding inside a garbage chute. The cops stand right in front of where he’s hanging and discuss how they’re not going to allow him to get away with Santa fraud. I’m pretty sure that’s not a real crime. Besides, aren’t they after him for evading a police officer? They leave, but a janitor chooses that moment to dump a large Santa decoration down the garbage chute. It hits Blake in the head and sends him crashing down to the basement. He lands unconscious at the feet of Don Stark’s character. Don thinks he’s hit the jackpot and starts to drag Blake away, but he spots his wallet. He decides robbing him would be easier, but he becomes even more ecstatic when he discovers Blake’s identity. He calls Blake the richest man in ten states and decides to take his money and credit cards, but Blake begins to wake. Don introduces himself as Lenny, but he soon discovers that Blake has developed amnesia from his fall. Lenny, being the genius that he is, decides to convince Blake that he’s really Santa and leads him to the mall manager. After some convincing, Blake buys the lie that he’s Santa and agrees to follow. I have a serious question. If Blake can’t remember who he is, then how does he still know about Santa? Is that how amnesia works? Lenny convinces Blake to take on the duties of mall Santa and Blake groggily bumbles his way through talking to a few children. Lenny collects his $50 from the mall manager and then heads to the ATM to use Blake’s debit cards. Unfortunately for Lenny, he discovers that the cards require a fingerprint scan. I’m pretty sure that wasn’t a thing on 1996 mall ATM machines. While Lenny is striking out at the ATM, two thieves approach the orphanage’s donation booth, which is located across from the Santa attraction. The lady at the booth is asleep, so they swipe the large donation jar and try to sneak away. One of the thieves drops the jar and it breaks, which draws the attention of a young girl (Brenda Song). She sees what they’re doing and calls for Santa to come help. Blake immediately springs to action, which is odd since he can’t even remember his name. He confronts the thieves, so they start trying to fight him with any of the Christmas decorations they can grab. Blake easily defeats them and tears up the Santa attraction in the process, but people cheer. Lenny returns to see the fight and tries to convince Blake to come to the ATM, but Blake decides he wants to go to the orphanage. He believes he can help them in some way. Lenny agrees to join him, but Blake asks, “If I’m Santa, where’s my sleigh?” Lenny tells him it’s getting new brakes and then offers him a ride on his scooter instead. Back at Frost’s mansion, we learn that Ebner is a germaphobe when he demands that Blight disinfects the papers he brings him. This explains the plastic covering and disinfectant sprayers on his property. Dr. Blight tells him he doesn’t think the shoe store owner will sell. However, as if on cue, the man loudly relents because the scientists have broken him. Frost tells the man to be out of his store by Christmas and then marks the property off his map. He declares that the orphanage is the last piece of land he needs and then makes a comment about adopting a new attitude. Blight thinks he’s making a joke and laughs, but Frost doesn’t get it. Dr. Blight and the scientists arrive at the orphanage before Blake. They’re driving an ice cream truck, for some reason. It’s never explained. It’s simply one of those random oddities in this movie. They’re greeted by Leslie (Robin Curtis, who you may know as Lt. Saavik from Star Trek III & IV). She runs the orphanage and she’s not happy to see Blight. He sarcastically asks her how the relocation plans are going, but he also tries flirting with her. She tells him to get lost, but he says they’ll be around if she needs them. She shuts the door in his face, which elicits a cartoonish cackle from Dr. Vial. They leave, but they use a chain to pull down the statue in front of the orphanage. One of the staff, Clayton (Garrett Morris), runs after them and foolishly stands in front of their ice cream truck. He doesn’t move. He throws his arms up in front of himself, but the truck stops short. The scientists are confused, but the camera pans back to show that Blake somehow stopped the momentum by grabbing the chain. I guess he’s supposed to be superhuman, but that isn’t explained either. Not only are the scientists not shocked by this, but they also mock Blake as they leave the scene. Blake then meets Leslie, Clayton, and some of the kids. Elizabeth, from the beginning of the film, is there and she says she knew Santa would answer her letter. Clayton then thanks Blake for saving him and asks his name. Blake says to call him Santa, which results in some amused grins from the adults. Leslie invites Blake and Lenny to dinner, which they accept. There, Blake meets Sarah (Mila Kunis), who informs him that Elizabeth is the only kid there that still believes in Santa, so he should humor her. Blake then explains that he felt drawn to the orphanage, but he doesn’t know why. He asks about Frost’s goons, so they explain that Frost wants the property. Elizabeth then brings Blake some milk and cookies, but Blake’s instincts kick in and he asks if they’re low-fat. After dinner, Clayton offers to let Blake and Lenny stay the night at the orphanage. He explains that they’re pretty much closed and they found homes for as many of the children as they could. There are only three left, Elizabeth, Sarah, and Taylor (Adam Wylie). Taylor looks sad and claims that the three of them are leftovers before leaving the table in a huff. Blake and Lenny then prepare for bed. Blake sees his face in the mirror, but he still can’t remember anything. Clayton gives the two of them pajamas to wear. Blake gets a normal robe, but Lenny is stuck with bunny pajamas that have ears and a tail. I’m not sure I want to know why this orphanage has adult size bunny pajamas. Blake continues staring into the mirror, so Lenny assures him he’s really Santa. The next morning, Blake arrives at breakfast, but he forgot to put on his costume. Elizabeth is confused, so Blake explains that Mrs. Claus says the beard tickles. He tells her that he wears a fake one for appearances. Blake sees that his fight at the mall made the front page of the newspaper and the headline says, “Santa with Muscles.” Leslie then says she finds him familiar and that’s when Lenny spots that they’re eating Blake’s breakfast cereal. His picture is on the box, so Lenny empties the cereal on his plate and hides the box. Then, Lenny sees Blake drinking some milk and has an epiphany. He realizes he can lift Blake’s fingerprint from the glass. While he has this revelation, the theme from 2001: A Space Odyssey plays. I halfway expected Ric Flair to enter the dining room. Lenny takes Blake’s glass under the pretense that he’s helping clean. Blake then talks with Elizabeth, who tells him all about Santa’s rules. They’re similar to Blake’s rules, but they’re practical and involve helping others. He doesn’t know what she’s talking about, but he likes the sound of it. Sarah then arrives and tells Blake she fixed his outfit. She presents him with a sleeveless Santa suit and even a utility belt. Are we supposed to believe she did all that overnight? Is this kid running a sweatshop in that orphanage? Blake asks where she learned how to do this and she tells him she learned it from a comic book called Mega Man. You mean to tell me this kid learned tailoring from a comic about a video game robot? This movie is insane. Blake puts on his suit, but there’s a knock at the door. He tells Lenny to get it and he opens the door to find a news crew. They heard about the Santa with muscles and wanted to interview him. Blake quickly dons his beard and steps outside while Lenny tries to convince the crew to pay him for the interview. The reporter asks Blake how he got there, but Blake doesn’t know what to say. Lenny tries to coach him through charades, but Blake keeps getting his hints wrong in comical fashion. It’s one of the few bits in this movie that legitimately got a chuckle from me. Blake realizes the interview is going terribly, so he tries to finish strong. He says, “There’s a new Santa in town and he knows if you’ve been naughty or nice, so be nice!” Meanwhile, Frost watches the broadcast and he’s angry that the orphanage is getting attention. He also says he finds the Santa familiar, but he can’t put a finger on why. Later, Lenny attempts to use the stolen fingerprints to access the ATM, but he discovers that he needed the left thumb, not the right one. Dr. Blight arrives and forces Lenny to join him in the ice cream truck. Frost appears on a TV screen and Lenny swears he will get his money. Frost isn’t worried about that. He wants Lenny to help get Santa away from the orphanage. Lenny returns to the orphanage and tries to convince Blake to leave, but he wants to stay. He hears Elizabeth singing and finds her in the chapel. She’s singing the song, “Angel Baby.” Blake recognizes it and sings along for a moment. Elizabeth explains that her mother used to sing it to her. She then rambles about window fairies that she sees in the chapel windows. I think she might be crazy! She then asks Blake about his parents, but he says he doesn’t remember them. They sing the song again and Blake looks up to see weird flickering lights in the chapel window. I’m starting to think Blake is crazy too. Later, Clayton tells Blake that he’s proud he finally made something of himself. Blake is confused, but he has no time to get answers. The window breaks and the head of the statue from earlier crashes into the room. There’s a Christmas card attached that reads, “Only one shopping day left until Christmas.” Blake looks out the window and sees Dr. Blight and company, so he goes to confront them. Blight tells Blake to leave, but he refuses. Blight then catches Blake off guard with some martial arts, but Blake recovers to beat him easily. He stuffs Blight’s cell phone into Blight’s mouth and throws him into the ice cream truck before the scientists drive away in fear. They go back inside, but Taylor seems distracted. He picks up the statue head and then literally disappears from the scene. The editing is so poor that there’s only a half-second beat between when he’s there and when Sarah notices he’s gone. Blake says he knows where Taylor went and they cut to Blake and Lenny outside Frost’s mansion. How did Blake know where it was located? He has some convenient amnesia. Lenny then mocks Blake for not having a plan, so Blake throws Lenny over the wall with ease. They sneak up to the house and stop Taylor just before he can break a window with his slingshot. Taylor says he was trying to protect everyone like Blake does. Blake convinces him to leave with Lenny, but Blake decides to stay behind to spy on Frost. He listens in at the window and overhears Frost talking about doing an excavation at the orphanage. Blake goes back to the orphanage and asks what’s underneath it. Leslie tells him about the catacombs under the chapel, which the kids use as a clubhouse. None of the adults seem bothered by this unsettling choice of play areas. Everyone goes down into the catacombs and they find a vault door with some initials carved into it. Sarah says they’ve only ever figured out the first three numbers of the combination and they’re 8, 24, and 16. This triggers something in Blake’s memory, so he puts in the last number and opens the door. On the other side, they discover a cave full of glowing crystals. Blake realizes they are what causes the flickering lights on the chapel windows. Oh, I guess they weren’t crazy after all. Sarah says she knows what type of crystals they are because she read it in a geology book. That’s more geology than Mr. Flint has done all movie. How does she know everything? Sarah is such a Mary Sue. She explains that the crystals have natural electricity in them and Taylor drops one in shock. It explodes on the ground, so everyone slowly leaves the cave. Blake is confused as to why he knew the combination and starts to realize he’s not Santa. Lenny tries to convince him, but he realizes it’s not working. He then decides to show Blake the camouflage clothing, which was conveniently sitting in the catacombs. There’s some red paint on it, but Lenny tells him it’s blood. He tricks Blake into thinking he’s running from a shady past and tells him to not worry about it and focus on the kids. Lenny then leaves the room and Frost calls for an update. Lenny is having second thoughts, but Frost doesn’t want to hear it. He tells him to be sneaky. They return to the orphanage to find there’s no electricity and they discover Dr. Blight in the kitchen. Blake enters the room and chases Blight up the stairs. They end up in the bell tower of the old chapel and start fighting. Blight grabs a candy cane decoration and hits Blake while saying, “Santa, you slay me!” It came off like he was hitting on Blake because his delivery was so awkward. Blake fights back and knocks out Blight, but he backs into an animatronic Santa, which somehow pushes him out of the tower. You’re telling me a plastic toy bested this freakishly strong man? Blake lands in a passing garbage truck and rolls over to see one of his products. He comments that his picture is still too small, which indicates that his memories are back. However, he falls unconscious. He somehow wakes in his own bed and thinks everything was a dream until he realizes he’s still in the Santa suit. His butler explains that the garbage man discovered him and brought him home. Blake calls the orphanage to explain, but Leslie angrily tells him to leave them alone. However, it’s a swerve!! They reveal that Frost’s scientists rigged up a recording of Leslie telling Blight to get lost. We’re supposed to buy that they knew to record that conversation earlier and knew exactly which bits to use. That’s hard to swallow, even for this movie. Frost then tells Dr. Blight to proceed with the plans. Later, at the orphanage, the kids are bummed because Santa disappeared. It’s only been 24 hours, but they all seem to have given up on him simply returning. They start to head to the kitchen for a snack, but the front door explodes open to reveal Miss Watt. The other scientists enter the room and spray disinfectant before inviting Frost to join them. He enters the room in a hazmat suit that is reminiscent of Peter Coyote in E.T.. Frost then drags the children down to the catacombs and we get a look at a new henchman that seems awfully familiar to me. Frost says he’s going to use the children to mine the crystals and then asks them nicely to open the vault. He promises them cookies, candy canes, and plum pudding, but they refuse. He orders the goons to take them away, but not before revealing that Lenny is working for Frost. The kids are dejected at this revelation. They’re led away, so Frost tasks Mr. Flint with opening the vault using a power tool. Back at Blake’s mansion, Blake stares at his breakfast in silence. His staff try to encourage him to do their usual training exercises, but he says no. Then, his phone rings and it’s Lenny, who tells him what’s happening at the orphanage. Blight catches Lenny and threatens Blake. He claims he will use Blake’s friends in his experiments if Blake interferes. Blake then hangs up the phone and crushes it before telling his staff that they have a mission. They suit up and head out, but they pass Clint Howard. He recognizes them and begins a chase. Blake’s staff use some of Blake’s healthy salad dressing as an oil slick and protein powder as a smokescreen to fend off the cops, but they keep coming. Blake then runs into a roadblock, so he stops. One of the cops pulls out a rocket launcher. Are they going to kill them!? That seems a bit extreme! Blake calls their bluff, so the cop shoots a rocket and Blake swerves. The rocket soars past Blake’s Hummer and hits Clint Howard’s car. He dives out of the way, but the car is destroyed. They arrive at the orphanage and Blake rigs jumper cables to the doorknob before having his chef knock on the door. One of the goons answers, but he’s electrocuted. It’s at this point that I notice the goons are all armed with weapons. Those weapons—are t-squares. I’m being 100% serious. They are wielding freakin’ t-squares!! This movie is ridiculous! Blake then finds the kids are being held in the kitchen. Elizabeth spots him and waves, so a goon checks the door. Blake slams the door into his face and knocks him out cold before entering the room. Elizabeth finally realizes he’s not Santa, so Blake introduces himself. She replies, “You’re not Santa. You’re better!” Then, Blake and the kids sneak into the room where Dr. Vial is working and spray him with a fire extinguisher. They also release some of his stink gas into his suit, which starts inflating. It’s not marked as laughing gas, but it causes him to cackle uncontrollably anyway. They continue down the hallway, but Miss Watt pulls Blake into the chapel. Blake thinks he’s going to fight her, but she introduces someone else to do her fighting. It’s—OH, NO!!! Is this really happening? The familiar goon from earlier is revealed to be—Brutus Beefcake in full Charlie Chan cosplay. He’s supposed to be an Asian henchman and even has a Fu Manchu. Worse yet, the credits list him as, “Sumo Lab Assistant.” He doesn’t look like a sumo wrestler and I don’t see him assisting any labs! Brutus then rips open his shirt and stomps around like a sumo wrestler, but Blake simply stomps on one end of a pew and drives it into Beefcake’s face. That’s it. He’s down for the count and we never see him again. Blake turns to Miss Watt and she says, “You wouldn’t hit a woman, would you?” A voice from the balcony responds, “He wouldn’t, but I would!” It’s Lenny and he pours a bucket of water onto Miss Watt, which electrocutes her due to the gloves. Wow, they just killed her. Isn’t this a movie for kids? Then, they cut to Clayton and Leslie in a room. Leslie paces around until Blake breaks down the door. Clayton jokes that he could have knocked. Blake ignores his quip and properly introduces himself to Leslie. They start to leave, but Clayton asks for a private word with Blake. He tells Blake that he knows he lied because Clayton knows his real last name. He reveals that it’s Torachevsky (or something like that). Blake asks how he knew that and Clayton reveals that Blake grew up at the orphanage. How did Blake forget that information, even before the amnesia? It becomes even more confusing when Clayton shows him a picture of Blake playing with his best friend—Ebner Frost. They are clearly not babies, so there’s no reason he should have forgotten being at the orphanage. It’s sadly never explained. Then, Blight discovers the unconscious goons in the kitchen, but Leslie soon enters the room. Blight tries hitting on her, but he makes the mistake of insulting the kids. She pushes him, so the kids trip Blight and he falls into the walk-in freezer and they close the door. Blake then makes his way down to the catacombs and confronts Frost. He calls him Ebby, which causes Frost to remember their childhood friendship. At that moment, Flint manages to open the vault, so Frost retreats through the door. Blake follows and Flint tries to stop him, but Lenny knocks out Flint with the vault door. Blake tries to convince Frost to stop, but Frost mocks Blake for living off his adoptive parents’ money while he had to steal and claw his way through life. Frost tells Blake to go back to his tanning beds and weight rooms, but Blake responds that being Santa changed him. Frost then attacks, so both men grab long crystals and use them as swords. They spark but they don’t explode. Earlier, Taylor simply dropped one and it blew up, but these can be used as swords? Be consistent, movie! Frost manages to knock away Blake’s crystal and has him on the ground, but Taylor shoots Frost with his slingshot. Leslie uses the opening to pull out the air hose on Frost’s hazmat suit and he panics. Unfortunately, all the commotion made the crystals unstable, which Sarah helpfully explains. The cave begins vibrating, so everyone runs. They make it outside in time to watch bolts of electricity envelope the orphanage and cause it to crumble inward. They stand around and watch in horror, as Clint Howard arrives in his burnt police car. He tells everyone to freeze, but the movie is too lazy to explain what happens next. They cut to later when the police are arresting Frost and his goons. We see that Miss Watt is still alive, so this movie thankfully didn’t go THAT far. Frost tells Blake he’s not through with him and then sneezes. Everyone laughs and Blake tells him, “Merry Christmas!” Then, Leslie asks where the children will go and Blake says he has an idea. No, it’s not Blake’s mansion. They choose to use Frost’s mansion as the new orphanage. It’s some time later and there are many more children. They are throwing a party on the lawn while Clayton mows. You would think he would have done that before the party. Blake invites the children to gather around a telescope and they use it to watch Frost and his goons doing hard labor in prison. Hold on. Are you telling me Frost’s mansion was next to a prison? Why would they choose that location for an orphanage? Everyone laughs at Frost’s misfortune and Elizabeth calls it a Christmas miracle. Then, she says, “I do believe in you—Blake.” He celebrates with the children and then tosses his old Santa hat onto one of the sculpted bushes. The camera focuses on it for a long time before the credits finally roll. I guess it was supposed to be some sort of symbolism. This movie was bizarre! It was poorly edited and made little sense. I’m curious as to what the original story was before the re-writes. I can certainly see why the original writer asked to have his name removed, but I can’t figure out what the original story would have been. Some of the design and creative choices were strange and unexplained. It felt like they were attempting satire, but failed miserably. As far as Hogan’s acting, it was passable at times. He thankfully dialed back the overacting of No Holds Barred, but it still wasn’t good. However, it was one of his less obnoxious performances. In the news interview scene, he even got a laugh out of me, so that’s something. I would not recommend watching this unless you love ripping on bad movies. Thanks for reading. You can follow the Facebook page for this blog by clicking here. You can also follow the Twitter page by clicking here. I look forward to your feedback. My next review will be business as usual. We progress into 1991 with Royal Rumble ‘91. Look for it on Saturday!